This blog post will provide example of end-to-end Selenium tests in Java with usage of Page Object pattern. Every responsible developer knows that end-to-end test is necessary at some point. When you want to test web application end-to-end, there is only one decent open-source option: Selenium. Of course end-to-end test suite have to be maintainable. To achieve that, I believe we have to use Page Object pattern for each web screen present in web application. Martin Fowler’s link explains very well benefits of this pattern, therefore I skip theory. We at Dotsub are using Java platform with Spring Boot for back-end. Therefore Java Selenium APIs were natural fit for our needs. This blog post will explain Page Object pattern on application built with Spring Boot. For UI, it will use famous Dan Abramov’s Todos example. This example was used for Getting started with Redux tutorial. It is simple single page application built on top of React + Redux JavaSript frameworks. It provides us decent functionality we can cover by Selenium test examples. Let’s take a look at functionality of this simple example. In text Input field, we can enter name of Todo item. Button Add Todo saves item into Todos list. 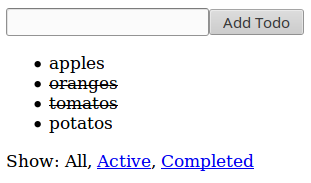 When we click on any Todo item we can mark it as complete or incomplete. In fact this Todos example application doesn’t communicate with Spring Boot server. Front-end assets are just served from Spring Boot application. But we don’t need such communication to demonstrate Page Object example. I used Spring Boot, because it’s trivial to integrate Selenium tests with it. Note that goal of this blog post isn’t to explain Selenium or its APIs. It is expected for reader to be slightly familiar with them already. Page Object class has two fields. First is Selenium WebDriver instance, which represents browser’s window wrapper used for controlling web page similar to real user. WebDriverWait is helper for waiting until HTML elements are rendered. Method get is used to load Todos page based on it’s URL. These three methods are private helpers for Todos actions shown later. We will used them to find HTML element or list of HTML elements based on the text they contain. For text search we use Selenium’s XPath APIs. I believe names addTodo and clickOnTodoItem are self explanatory. We will use them to enter test into Todos input list, click Add Todo button and to mark Todo items complete/incomplete. Notice that return value is Todos Page Object instance, so that we can use fluent API during testing. This mechanism will keep our tests less verbose. These three methods are using for clicking on filter buttons All/Active/Complete. Last two methods are used to verify if given Todo item is shown on not shown. When it’s shown we can verify if it’s completed via parameter expectedStrikethrough. These test cases cover some basic scenarios real user could perform against our Todos application. I am not going to explain them, because they are nicely readable due to usage of Page Object pattern. Separate huge benefit of this pattern I want to point out is decoupling tests from HTML. If we would change HTML structure on Todos page, we would need to change only Page Object class. Test cases would remain untouched. Example code with all project files is hosted on Github.